Officially known as the Republic of Iceland, is located in northwestern Europe. It comprises of the island of Iceland and its outlying small islands in the northern Atlantic Ocean between Greenland, Norway, Scotland, Ireland, and the Faroe Islands. Iceland’s sparkling glaciers, hot thermal springs, spectacular geysers, active volcanoes, lava fields, stunning waterfalls and snow-capped mountains, certainly makes it the original ‘land of fire and ice’. Iceland is a very big island with a unique landscape which is rugged and colorful with black lava, red sulfur, hot blue geysers, rivers, waterfalls, bays, fjords and green valley. 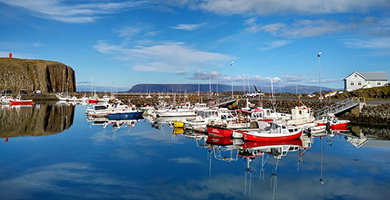 The capital of Iceland is Reykjavík which is also the biggest city of Iceland. Nearly half of Iceland’s population resides around Reykjavík. The popular visitor attractions are centered on this city. The most famous attraction is Gullfoss double-tiered waterfall which is set off with an outstanding rainbow and hot springs of Geysir. People may wonder what someone can do in Iceland. If you hear the list you will be amazed that there are so many things to do and see here. From watching whales to chic fine dining, hiking, seeing Europe’s largest glacier Vatnajokull, fishing in rivers, horse riding, rafting, exploring the landscape on a snow scooter, shopping designing wear, Summer Solstice Festival, visit island of Grimsey to cross the Arctic Circle, visit medieval farm at Stong and what not, the list is endless. Like any other country Iceland has its own customs too and normal courtesies should be followed. Handshaking is customary. Visitors are invited to homes when on a business trip and usual courtesies should be observed. The people pay careful attention to their appearance and, as for most Western countries, casual wear is widely acceptable. Service charges are added to the bills usually and tips are not expected. By Air – The national airline of Iceland is Icelandair which operates to many international destinations such as Amsterdam, Baltimore, Boston, Copenhagen, Frankfurt, Glasgow, Halifax, London, Minneapolis, Orlando, Oslo, Paris, Stockholm and Washington, plus other destinations in the summertime only. Other international airlines working from Iceland include Air Greenland (website: www.airgreenland.gl) and Iceland Express (website: http://www.icelandexpress.com). Other, mainly Scandinavian, carriers also have services. Some airlines like Condor and Corsai, offer flights during the summertime. Flights also operate to the Faroe Islands and Greenland during the summer months. Major airport is Keflavik International Airport (KEF) situated 31 miles south of Reykjavik.